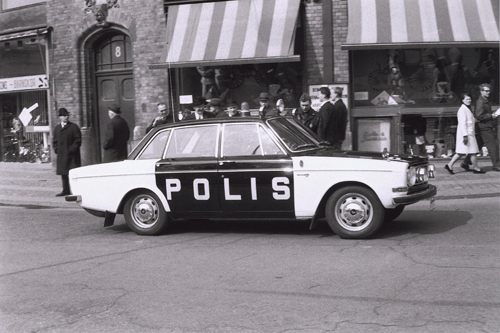 1967 – Volvo 144 S Polis at Basargatan near Kungstorget in Göteborg, Sweden. Basargatan is a street in the district Inom Vallgraven i central Göteborg. 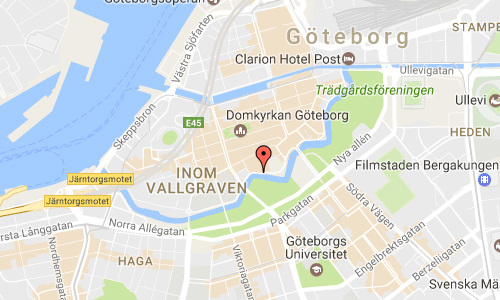 It is about 350 meters long, and extends from the Lilla Korsgatan to Kungsportsplatsen. The street even number from 2 to 12 and odd number from 5 to 7. 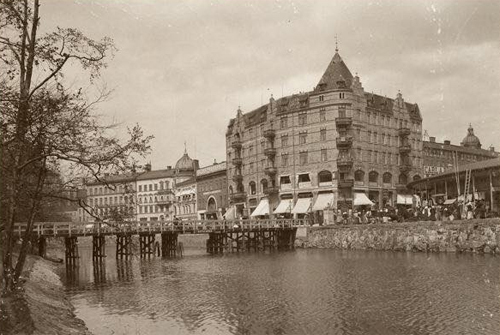 The name was established in 1852 after the bazaar building on the Kungstorget, which was built in 1850 and demolished in 1966. 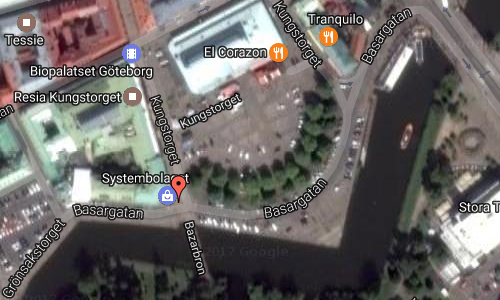 Possibly names Stora and Lilla Bazargatan have occurred (1857, 1864) in all or part of the route. 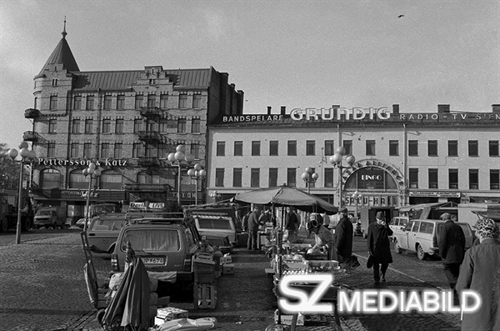 In 1985 the so-called Katzska house in the southwest corner of the Kungstorget was demolished. Then there was smoke again at the Katzska balcony. For those who were not around ther between the years 1940 and 1970, it is difficult to understand what significance it had. The balcony belonged earlier to the clothing firm Pettersson and Katz and had a very strategic position, facing out towards the square. It became noticed during the spring of 1943. The Second World War lasted, Norway was occupied and in Göteborg planned a soiree in support of Norway and the family Katz whom borrowed happily out their balcony for the event. The balcony became the place where all the major charity concerts took place. Whether it was Karl Gerhard performance in the 40’s, Lapp-Lisa in the 50’s, pop idol Tages in the 60’s or Sten-Åke Cederhök in the 70’s. 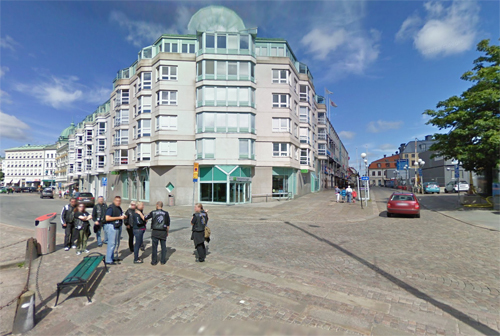 The advantage with the location was so clear that it could fit many people in the square. Up to 45000 people crowding around the Saluhallen. What most people remember, that was intermittent, was that this year’s Lucia appeared on the balcony. The final Lucia festivity waved there in 1974. 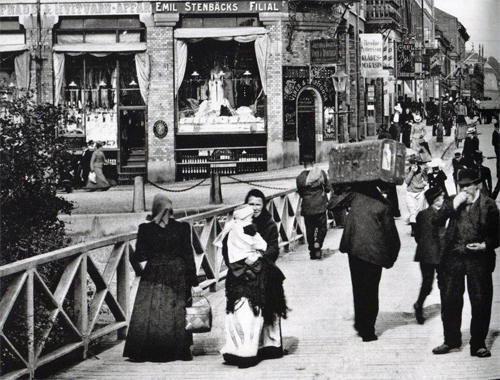 The same year the family Katz sold their business and Katzska balcony ceased as the city’s own charity scene. Yet, raised some angry voices when both bosses Katzska house and the house was demolished. It was after all one historic place had disappeared.